The first session of the International Conference on Chemicals Management (ICCM1) gathered Governments and intergovernmental and non-governmental organizations in Dubai, United Arab Emirates, from 4 to 6 February 2006. The session was the culmination of a process of negotiation between Governments, Intergovernmental organiyations, non-governmental organizations and others within the framework of the Preparatory Committee for the Development of a Strategic Approach to International Chemicals Management. 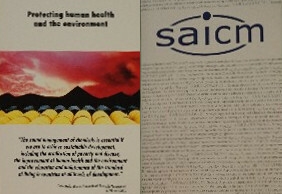 The Committee had been established in response to decision SS.VII/3 of the United Nations Environment Programme (UNEP) Governing Council, of 15 February 2002, which called for the development of a strategic approach to international chemicals management, work which was subsequently endorsed at the World Summit on Sustainable Development in September 2002 and at the High-level Plenary Meeting of the United Nations General Assembly in September 2005. ICCM1 adopted the Strategic Approach to International Chemicals Management (SAICM) and sets out strategic priorities, institutional arrangements, terms of reference for the Quick Start Programme, amongst others things for its implementation.